​Looking to give the gift of relaxation? 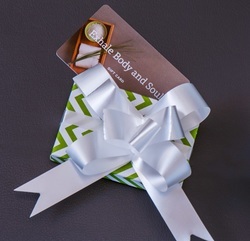 Click here to purchase your Exhale Body and Soul gift card! All gift card sales are non refundable for cash and cannot be used to purchase another gift card. Gift cards must be presented at time of redemption. Exhale Body and Soul not responsible for lost or stolen gift cards. Gift cards can be used on services or retail items.